St Kilda is an inner suburb (neighbourhood) of the metropolitan area of Melbourne, Victoria, Australia, 6 km south-east of Melbourne's Central Business District. Get some cultural insight at Rippon Lea Estate and Our Lady Ta' Pinu Shrine. Visit St John's Anglican Church and Christ Church St Kilda for their historical value. Explore St Kilda's surroundings by going to Australian National Aviation Museum (in Moorabbin), Werribee (Werribee Open Range Zoo & Adrenaline & Extreme Tours) and Lysterfield Park (in Narre Warren). 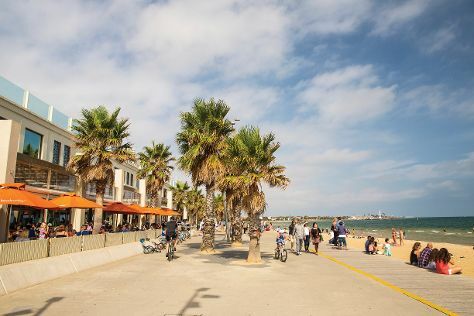 Next up on the itinerary: enjoy the sand and surf at St. Kilda Beach, take in the spiritual surroundings of The Swedish Church, admire the natural beauty at Wilson Botanic Park, and take an in-depth tour of Jewish Holocaust Centre. To see more things to do, reviews, where to stay, and tourist information, refer to the St Kilda trip itinerary planner . Singapore, Singapore to St Kilda is an approximately 11-hour flight. You can also do a combination of flight and shuttle. The time zone difference moving from Singapore Time to Australian Eastern Standard Time (Victoria) is 2 hours. Plan for much colder temperatures traveling from Singapore in October, with highs in St Kilda at 23°C and lows at 11°C. Wrap up your sightseeing on the 30th (Wed) early enough to travel back home.